Explores the emotions that siblings of children with Asperger's Syndrome (AS) commonly experience. With illustrations throughout, this book will help siblings to understand that their emotional responses - whatever they are - are natural and OK. 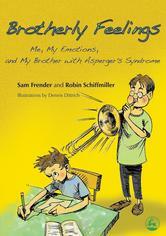 The book is written by Sam Frender (age 8) who is "neurotypical" and his mother. He shares his experiences about living with his brother Eric (age 13) who has Asperger's Syndrome.